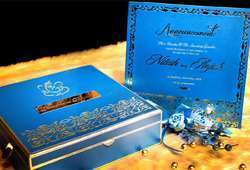 We are one of the leading organizations engaged in delivering our clients with best quality Turquoise Metal Wedding Card. 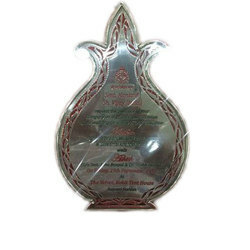 This is made available in customized designs as well to meet our clients’ requirements. These Metal Wedding Cards are a unique form of sending out invites. Traditioanl Card in Ganesha at Front with an Free Hand Design in Background . The Card comes in Two Inserts of Shimmery Metallic Paper. Perfumed Metallic Card in Digital Print.